新刊登物品 VINTAGE QUILTED BOX SEWING JEWELLERY STATIONERY FRENCH? 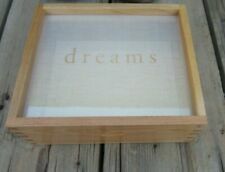 PEACOCK 13" X 10"
新刊登物品 "DREAMS" Wood Box Jewelry Keepsake Organizer Case Glass Top Display Storage New! OVER 20 DIFFERENT PATTERNS TO CHOOSE FROM! !